Roma captain Francesco Totti took a selfie of himself to celebrate becoming the joint top scorer in the capital derby with the equaliser in a 2-2 draw against Lazio. The Italy forward scored both second-half goals for second-placed Roma and was handed a mobile phone by one of the coaching staff to mark the leveller. 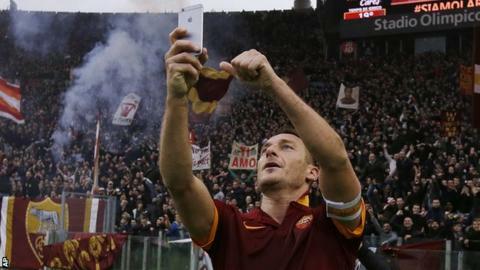 The 38-year-old held the phone up and took a photo with the Roma fans behind him as his side recovered from 2-0 down. Lazio led after Stefano Mauri converted Felipe Anderson's cross, before the latter doubled the lead from 20 yards. Totti, who has now scored 11 times against Lazio, said: "I thought about it during the week. "Although it's in fashion, I don't usually take them because I want my private life to stay that way, but this was a special occasion, something to be remembered for a long time." Roma went into the game knowing victory would take them above Juventus, ahead of the champions' trip to fourth-placed Napoli later on Sunday. But it was Lazio, starting the match in third place, who opened up a 2-0 half-time lead. Totti reduced the arrears with a fine angled strike three minutes after the restart and claimed his second from close range just after the hour to set up a tense finale. It was his 239th goal in Serie A. Silvio Piola holds the record with 274. Match ends, Roma 2, Lazio 2. Second Half ends, Roma 2, Lazio 2. Attempt saved. Antonio Candreva (Lazio) right footed shot from long range on the right is saved in the centre of the goal. Assisted by Luis Pedro Cavanda. Attempt missed. Adem Ljajic (Roma) right footed shot from the left side of the box misses to the right. Assisted by Daniele De Rossi. Hand ball by Mattia Destro (Roma). Attempt saved. Miroslav Klose (Lazio) right footed shot from the centre of the box is saved in the bottom left corner. Attempt blocked. Stefano Mauri (Lazio) right footed shot from the centre of the box is blocked. Assisted by Antonio Candreva. Attempt blocked. Antonio Candreva (Lazio) right footed shot from the right side of the box is blocked. Attempt missed. Ogenyi Onazi (Lazio) left footed shot from outside the box misses to the left following a corner. Corner, Lazio. Conceded by José Holebas. Attempt missed. Davide Astori (Roma) header from the centre of the box misses to the left. Assisted by Miralem Pjanic with a cross following a set piece situation. Miralem Pjanic (Roma) wins a free kick on the right wing. Foul by Luis Pedro Cavanda (Lazio). Delay in match Francesco Totti (Roma) because of an injury. Francesco Totti (Roma) wins a free kick in the defensive half. Substitution, Roma. Mattia Destro replaces Juan Iturbe. Substitution, Lazio. Luis Pedro Cavanda replaces Stefan de Vrij because of an injury. Davide Astori (Roma) wins a free kick in the defensive half. Foul by Antonio Candreva (Lazio). Delay in match Stefan de Vrij (Lazio) because of an injury. Stefano Mauri (Lazio) wins a free kick in the defensive half. Attempt saved. Kevin Strootman (Roma) left footed shot from outside the box is saved in the centre of the goal. Assisted by Adem Ljajic. Substitution, Lazio. Miroslav Klose replaces Filip Djordjevic. Substitution, Lazio. Ogenyi Onazi replaces Felipe Anderson. Goal! Roma 2, Lazio 2. Francesco Totti (Roma) right footed shot from the right side of the six yard box to the bottom left corner. Assisted by José Holebas with a cross. Corner, Lazio. Conceded by Morgan De Sanctis. Attempt saved. Antonio Candreva (Lazio) right footed shot from outside the box is saved in the top centre of the goal. Dusan Basta (Lazio) wins a free kick in the attacking half. Offside, Roma. Kevin Strootman tries a through ball, but Francesco Totti is caught offside.